The deferrals and defaults have only emerged in the last few days, traders said, and have contributed to a drop in iron ore and coal prices. A senior executive at another large trading house also confirmed there had been defaults and deferrals in both thermal coal and iron ore.
China’s economy grew 8.1 per cent in the first quarter from the same period of 2011, the weakest rise in nearly three years but still pointing to a so-called soft landing. Pray tell how or why does any of this portend a soft landing? The next two paragraphs are more realistic. Other key economic indicators followed by Chinese policy makers, including electricity consumption, rail cargo volumes and disbursement of bank loans, point to a sharper slowdown, suggesting the risk of a hard landing. Soft commodities such as soybeans and cotton have also seen Chinese customers default in the past two weeks, a trader at a third global trading house said. 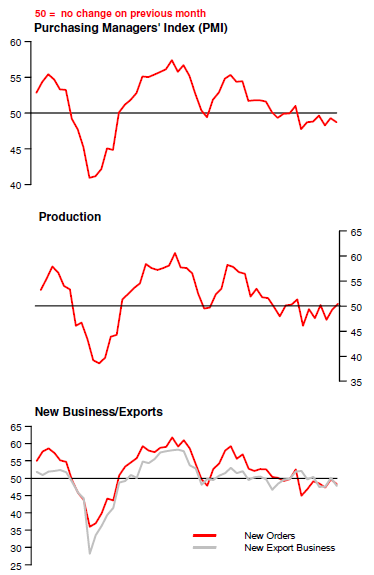 China shows modest deterioration in operating conditions during May according to HSBC Flash China Manufacturing PMI. “Manufacturing activities softened again in May, reflecting the deteriorating export situation. This calls for more aggressive policy easing, as inflation continues to slow. Beijing policy makers have been and will step up easing efforts to stabilize growth, as indicated by a slew of measures to boost liquidity, public housing and infrastructure investment and consumption. The question of the day is: How does Markit find these perpetually bullish clowns every month for every country? Here’s my “as long as” thesis: As long as pigs have wings, they will fly. I am amused that the vast majority of economists still have not figured out that pigs don’t have wings and neither does the China soft landing theory. For further discussion, please see 12 Predictions by Michael Pettis on China; Non-Food Commodity Prices Will Collapse Over Next Three to Four Years; Nails in the Hard Landing Coffin?